Cymbal meinl hcs 16" crash.They are made from MS63 alloy for a warm, harmonic and balanced ..
Cymbal meinl hcs 18" crash.They are made from MS63 alloy for a warm, harmonic and balanced ..
Cymbal meinl mcs 16" crash.Fast response with a bright, full-bodied sound. Clear and penetr..
Cymbal graft furia brilliant rock 15" crash.The Furia Series, of GRAFT cymbals is..
Cymbal graft myra brillinat rock 15" crash.The Myra Series, of GRAFT cy..
Cymbal graft furia brilliant rock 16" crash.The Furia Series, of GRAFT cymbals is..
Cymbal graft myra brilliant rock 16" crash.The Myra Series, of GRAFT cy..
Cymbal constantin classic 14" crash.Their hammered and lathed surfaces, warm sounds an..
Cymbal meinl classics traditional medium 16" crash.Wide frequency spectrum with a warm soun..
Cymbal meinl mb10 14" medium crash.Bright, warm and well-balanced sound in a wide dynamic r..
Cymbal constantin diamond 14" crash.The DIAMOND Series, of Constantin cymbals is the brilli..
Cymbal constantin ponthus 14" crash.Their sound is dark, and so is their oven-blackened loo..
Cymbal constantin classic 15" crash. Their hammered and lathed surfaces, warm sou..
Cymbal constantin diamond 15" crash.The DIAMOND Series, of Constantin cymbals is the brilli..
Cymbal constantin ponthus 15" crash.Their sound is dark, and so is their oven-blackened loo..
Cymbal meinl soundcaster custom medium 14" crash.The cymbals of the Soundcaster Custom Seri..
Cymbal constantin classic 16" crash.Their hammered and lathed surfaces, warm sounds an..
Cymbal meinl generation x safari 16" crash.MEINL's innovative and award-winning Generat..
Cymbal meinl generation x synthetic 16" crash.MEINL's innovative and award-winning Gene..
Cymbal meinl mb8 heavy 16" crash.The MB8 Series stands for a new era in B8 alloy. 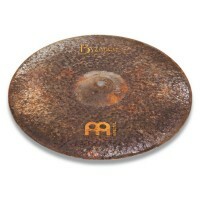 The cymba..
Cymbal meinl mb8 medium 16" crash.The MB8 Series stands for a new era in B8 alloy. The cymb..
Cymbal meinl amun medium 16" crash.Fast response with a bright, full-bodied sound. Clear an..